You Say It’s Your Birthday! | Sprezzatura, Y'all! Saturday was my birthday. It rained most of the day and I tried really hard not to take it personally. We didn’t do much because of the rain. We went to the Arezzo antique market and timed it just right so that it wasn’t raining until we were on our way out. 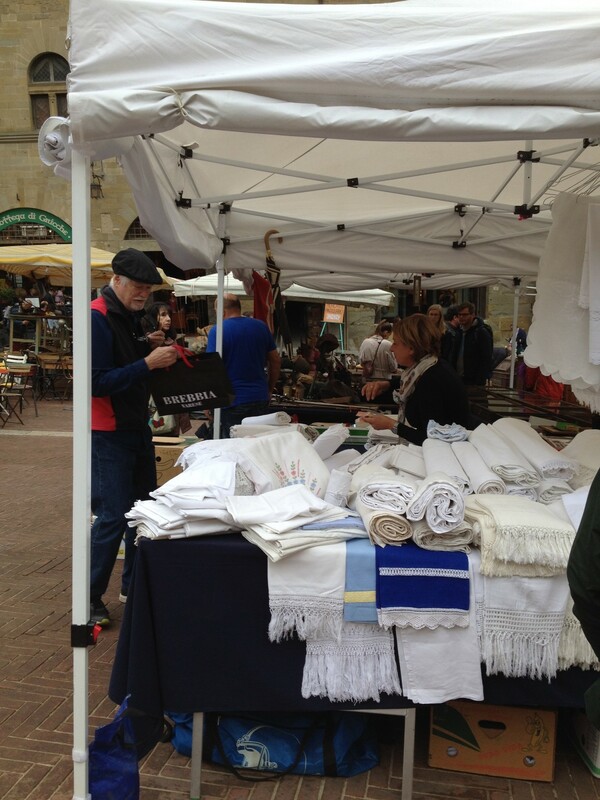 Arezzo has a renowned antique market the last weekend of every month. It was a little sparse Saturday because of the rain, but we managed to ohh and ahh over many things. We were on a mission to get some of the beautiful Italian cut work curtains for our friend Myra. Fortunately, we found a couple of linen dealers and bought what we thought would work for her. We had an interesting time trying to convert inches to centimeters, figure out how to ask for a measuring tape, then measure everything. Myra, if these don’t work, it wasn’t because we didn’t put our all into it! Since timing is everything and we are committed to eating as much as possible before we leave, we finished our linen shopping in time for lunch. We ate at a place we’ve been to a few times right off the main piazza. It’s a Slow Foods place and is a cute, cozy space with tons of wine for sale. We couldn’t buy any wine, which made us a little sad, but we had a wonderful glass of their house wine, which is a Rosso di Montepulciano. Not bad. I had one of my favorite fall dishes – pappa con pomodoro. It’s another version of the bread soup, this one with tomatoes and bread. I love this cucina povero – poor cooking. It reminds me of the American south, where nothing went to waste and people figured out ways to stretch what they had. We shared a panzanella salad – that’s really a summer dish, so you can tell we’re right on the cusp of the season change here. Panzanella, again made with stale bread, is a simple combination of whatever you have mixed up together and doused in olive oil. This one was very traditional with tomatoes, cucumber, and onions. We also had a cheese tray with four huge hunks of cheese that we thought we would never finish. We did. Steve also ordered a simple bruschetta with olive oil. This sounds so ho-hum, but it’s a flavor explosion. Crisp grilled bread, a tiny sprinkling of salt, and a healthy dose of olive oil on top. Tuscan bread is not salted, so the addition of a tiny bit of salt really makes a big difference here. It’s the kind of thing you eat and then taste on your lips even after you’ve gone on the next dish. Steve also ordered roast pork with potatoes. The Tuscans LOVE potatoes. I’m not exactly sure why. They have them with almost every meal. Every time we’ve eaten in someone’s home, they serve roasted potatoes. They’re on every menu and on almost every plate. Well, we love potatoes, too, so it’s one more culinary joy for us. These are always so good – that kind of roasted potato that has a crisp, browned skin and a fluffy interior. Again, this was a very, very simple meal. Nothing complicated. Many of them recipes that Italians have been making for generations, mostly in the same way. It makes me so happy to see food prepared in this way. Wonderful ingredients respectfully brought together in a straightforward way. I think of some of the dishes we get at restaurants in the US – ingredients disguised in foams and sauces and everything way more complicated than it needs to be. And I wonder why it has become this way. After lunch the rain really kicked in. It became an officially dreary day. We would run outside during breaks in the rain only to be caught up in the next shower. As sad as it is, we’ve started saying our goodbyes to people. We leave early Monday morning (we’d like to leave early, but we are in Italy so we shall see when we get away) and chances are we won’t see everyone before now and then. So when we run across someone, we tell them goodbye. They all want to know when we’ll be back. That’s a good question with no easy answer. So we say soon and they smile and nod. We ended the day with dinner at La Nena, one of my favorites restaurants. We’ve been saving it for my birthday. This place has a pretty extensive menu, but not everything is always available. They use what they have, what’s fresh, what’s available. So if they didn’t get any rabbit, it’s still on the menu but you can’t order it. I ordered a white bean soup that they didn’t have, but they offered a different bean soup. The porcini fritti are always on the menu, but if they don’t have fresh porcinis, they don’t serve it. Fortunately for us, we’re still in porcini season, so we got them. Steve had ravioli with butter and sage. Then he had a mixed grill of different meats. It was a plate of meat the likes of which you’ve never seen. So good. I had a pork chop because is there anything better than a good pork chop? A wonderful bottle of Chianti. And dessert – panna cotta for me and vin santo and cantucci for Steve. The total bill? $80. I shudder to think what that would have cost in Atlanta. I’m guessing around $200. Another night we waddled to bed. But it was worth every pound, roll, lump, and bulge. Sounds like a darn good birthday to me…food-wise for sure! 🎉 Enjoy your night in Firenze!